Review by AllTheBestFights.com: 2018-11-10, fight not so exciting between Yuriorkis Gamboa and Miguel Beltran Jr: it gets two stars. The 2004 Olympic flyweight gold medalist, former IBF and Wba Fw champion Yuriorkis Gamboa entered this fight with a pro boxing record of 28-2-0 (17 knockouts) and he is ranked as the No.9 super featherweight in the world (currently the #1 in this division is Miguel Berchelt). He lost to Robinson Castellanos in May 2017 (Gamboa vs Castellanos) but then he has beat Alexis Reyes (Gamboa vs Reyes) and Jason Sosa (Jason Sosa vs Yuriorkis Gamboa). His opponent, Miguel Beltran Jr, has a record of 33-6-0 (22 knockouts) and he entered as the No.271 lightweight. He was defeated by Casey Ramos in 2017 but he came back to win in 2018 with Misael Munoz. 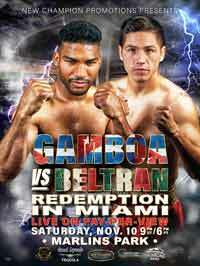 Gamboa vs Beltran is the main event of the evening. Watch the video and rate this fight!